As I mentioned in previous blogs, my great-uncle Robert Krueger passed away recently. His daughter Esther has graciously allowed me access to the family archives of photos and other historical materials. I have been making my way through the boxes and envelopes finding little treasures as I go. I’d say at least 60% or more of the material is from the family of Robert Krueger’s wife Shirley Paulus. 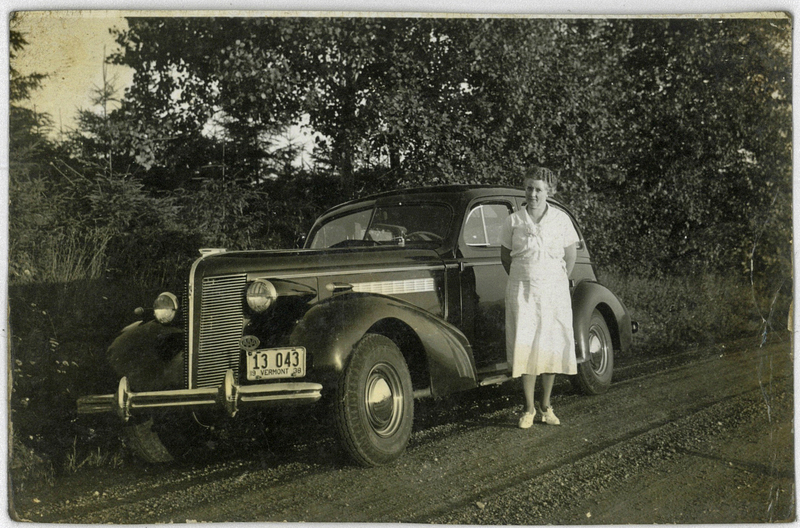 So if someone from the Paulus, Langsdorf, or Lenz families comes across this blog… let me tell you, there’s a gold mine in some boxes in my kitchen at the moment! I’ll probably write something about the Paulus family here at some point soon, just to leave a trail for any genealogists who are (or will be) working on that family. To the point of this blog: I came across something tonight that really moved me, even though it’s not directly from my family. Shirley’s great-grandfather Heinrich “Henry” Paulus (1829-1905) immigrated to the US from Koblenz, Germany in May of 1868 aboard the “Hansa and Deutschland”. He left behind his Uncle Philip, and the rest of the Paulus family. Then WWI and WWII intervened. 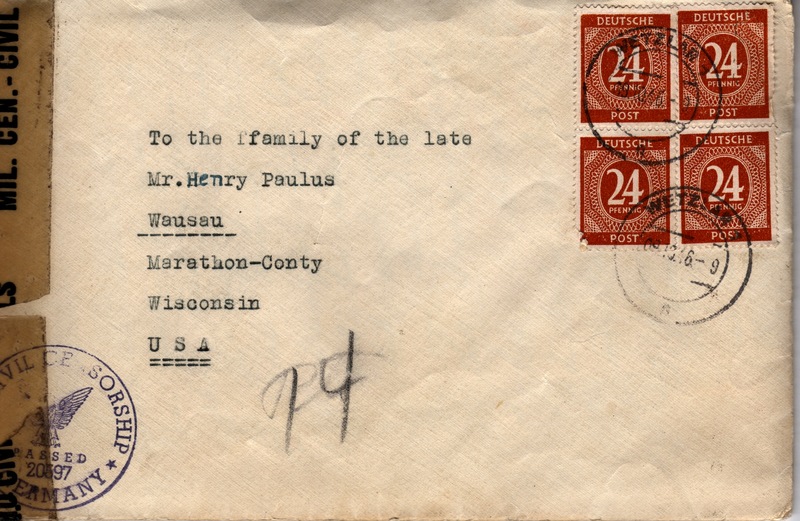 In 1946, about a year and a half after WWII ended, the Paulus family who had been left behind in Germany reached out twice to the Paulus family who had immigrated to Wisconsin. One letter [written by Philip’s son, who was also named Philip] was sent, but the family could not read the German writing and the letter was lost for some time when they took it to be translated. 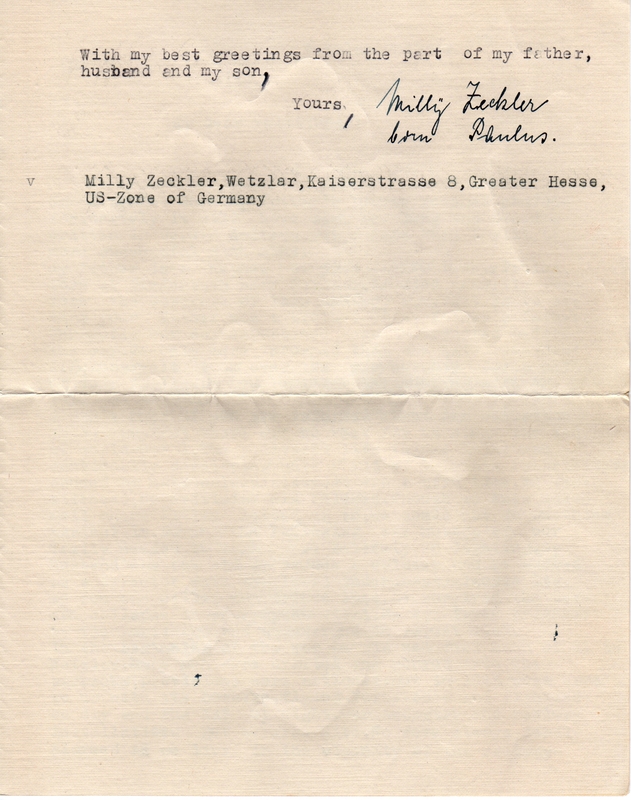 The second letter, written by Philip Jr.’s daughter Milly Paulus Zeckler (born about 1900), reached the family from Wetzlar, Gross-Hessen, Germany. I’m attaching it here because it is a moving, evocative bit of history. It tells of the situation of the German people between WWI and WWII in a way I’ve not seen written about before. Can I assume that my father’s letter reached you? Unfortunately it will have been too long and besides written in German letters. But I hope that I will be more successful with mine. My father is a nephew of your father henry Paulus, born at Tiefenbach near Wetzlar. He died shortly before the outbreak of this unhappy war. That is to say that your father was a brother of my father’s father. 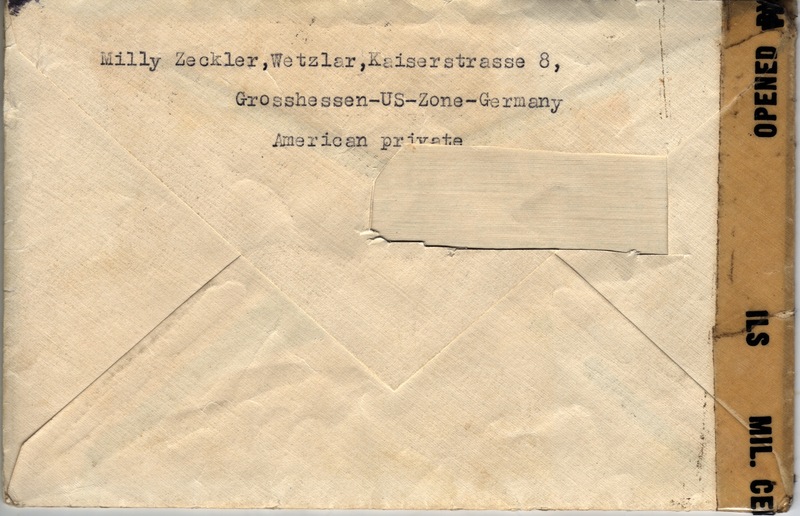 Unhappily our correspondence was interrupted before the war. 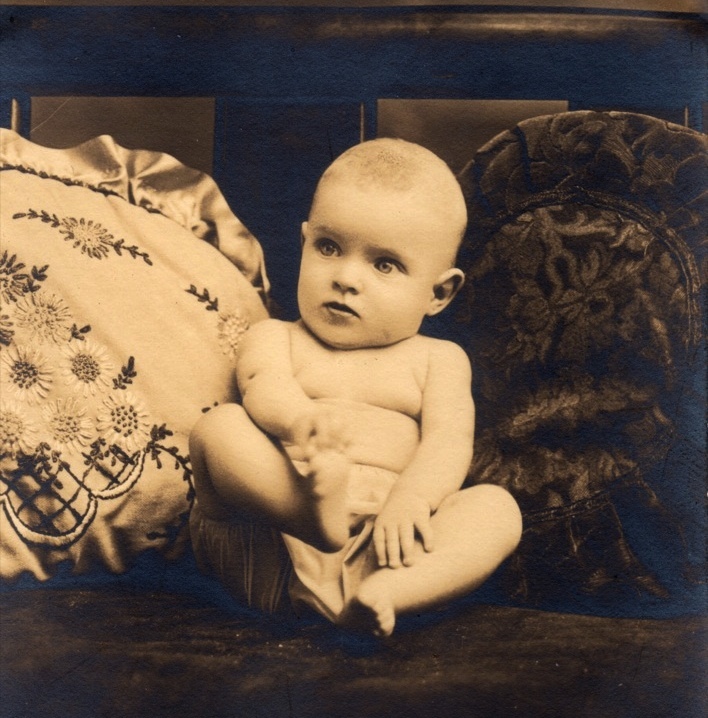 We only were informed that the late President F.D.Roosevelt took over the sponsorship for a child of your_family. Do you remember the cutting with the picture you sent us? station. In January 1945 even our house was bombed but it is now [restored]. There were always alerts. With the arrival of the Americans we got at last the long awaited rest. We are happy to live in the American zone and not in the Russian one. With regard to the other occupied zones food in ours is best: Some 1500 calories per day. We can talk to the G.I and his officers who behave in a correct and decent manner. In some way we feel ourselves connected with them,more at least as with the French or even with the Russians. My father had to suffer hard the last years of the war. It would not have been much and the steady run to the shelters, the bad food and the continuous upsetting of his weak body by the howl of the sirens would have killed him. But he succeeded in surviving the war. For a time we evacuated him to the small country town of Braunfels in order to get him out of the dangerous zone of Wetzler with its big Industry. In the last phase of the war he was unhappy enough to lose a great part of his clothing and property by plundering Russians and [Polish],not to talk of the damage done by the bombs. By now he is somewhat, what you may call OK. if it were not the insufficient food supply. He is 83 years old, nearly biblical age. His wife Elizabeth passed away in 1940, so that he lives now with us. 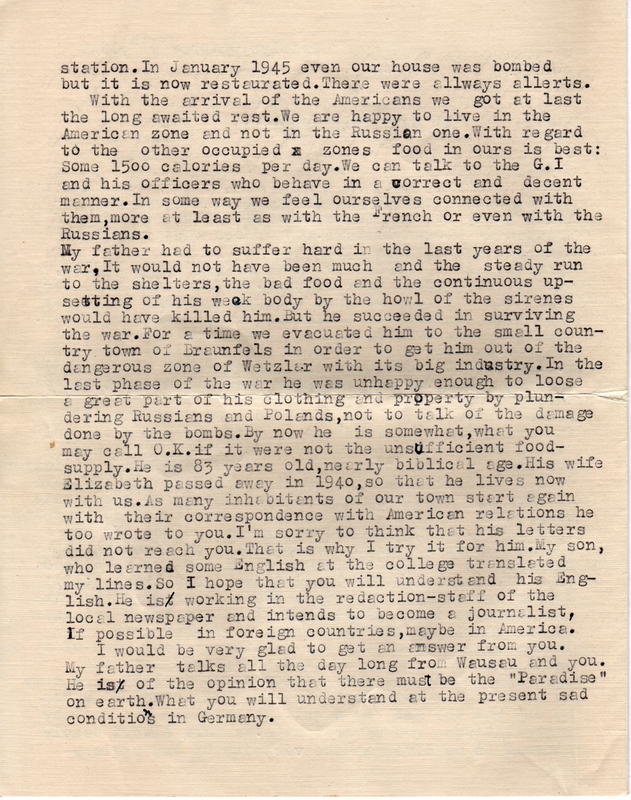 As many inhabitants of our town start again with their correspondence with American relations he too wrote to you.I ‘m sorry to think that his letters did not reach you. That is why I try it for him. My son, who learned some English at the college translated my lines. So I hope that you will understand his English. He is working in the redaction—staff of the local newspaper and intends to become a journalist, If possible in foreign countries, maybe in America. I would be very glad to get an answer from you. My father talks all the day long [about] Wausau and you. He is of the opinion that [Wisconsin] must be the “Paradise” on earth. What you will understand at the present sad conditions in Germany. The family tried writing back, but their letters were returned. 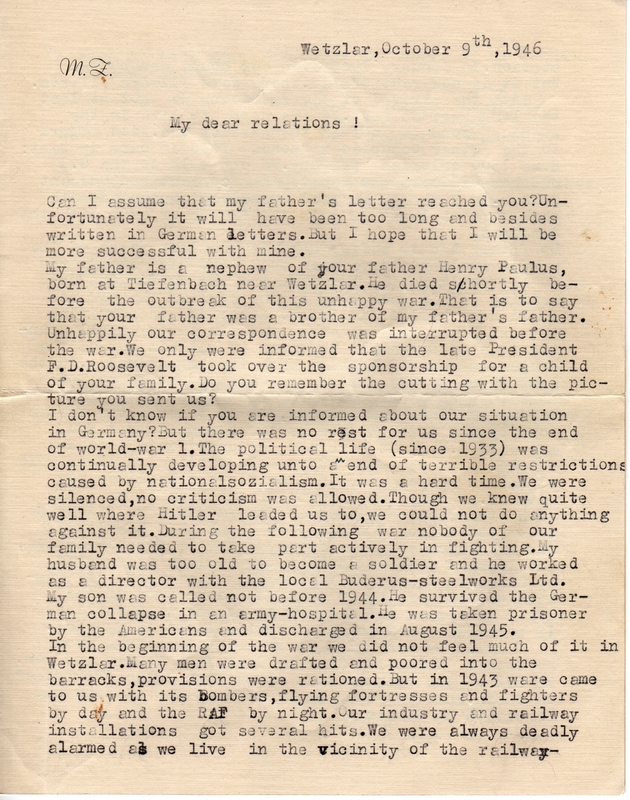 Finally, 11 years later in 1957, Henry Paulus (grandson of Heinrich) wrote another letter reaching out to the family still living in Germany. I don’t know if that letter was received, or if the two branches of the family ever did get in contact. I’ll ask Esther about it and report back here when I post the second letter. 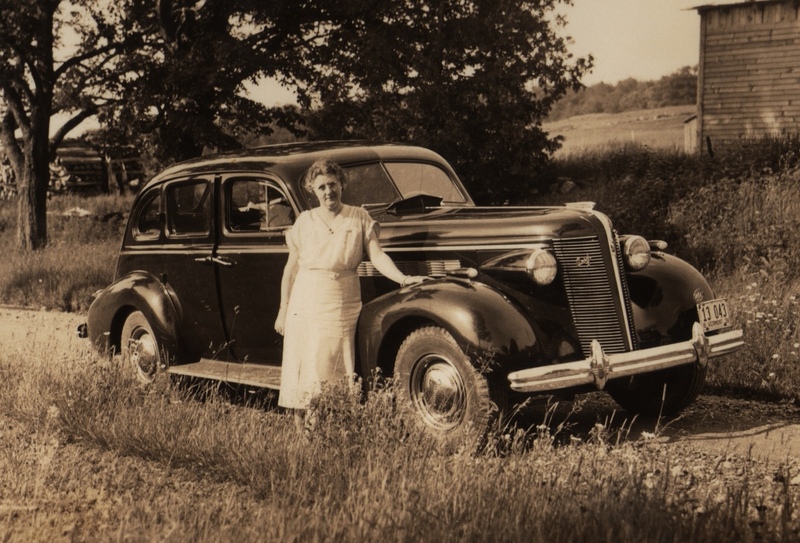 More photos from the estate of my late Grand-Uncle, Robert William Krueger. 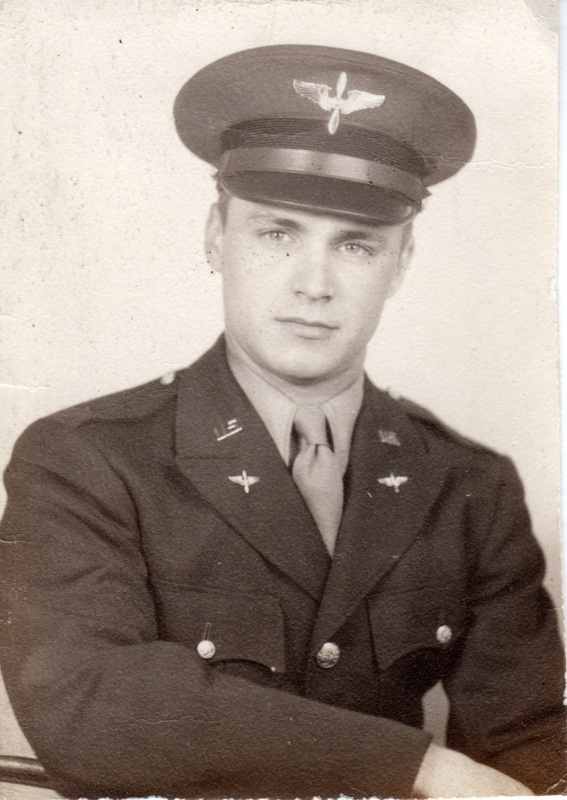 Cadet Lloyd O. Krueger, at flight training school graduation, 1944. 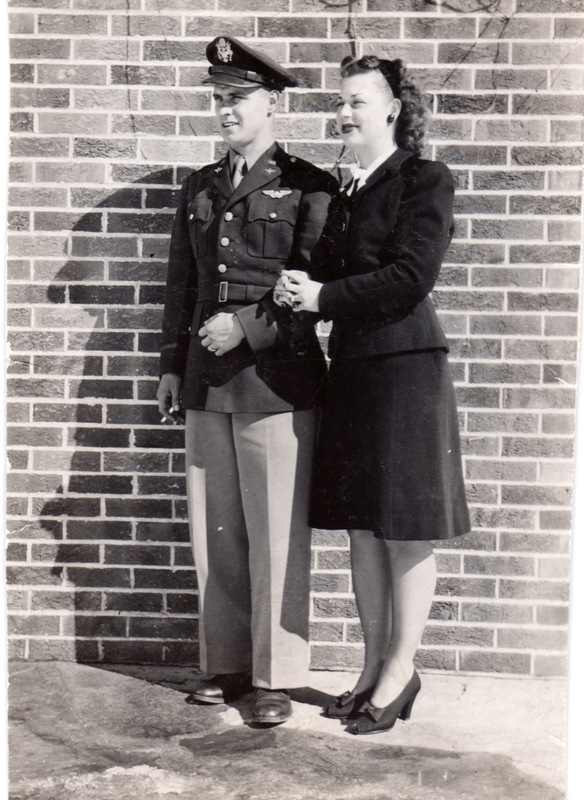 Lloyd Krueger and Norma Schmidt, around the time of their engagement, 1944. 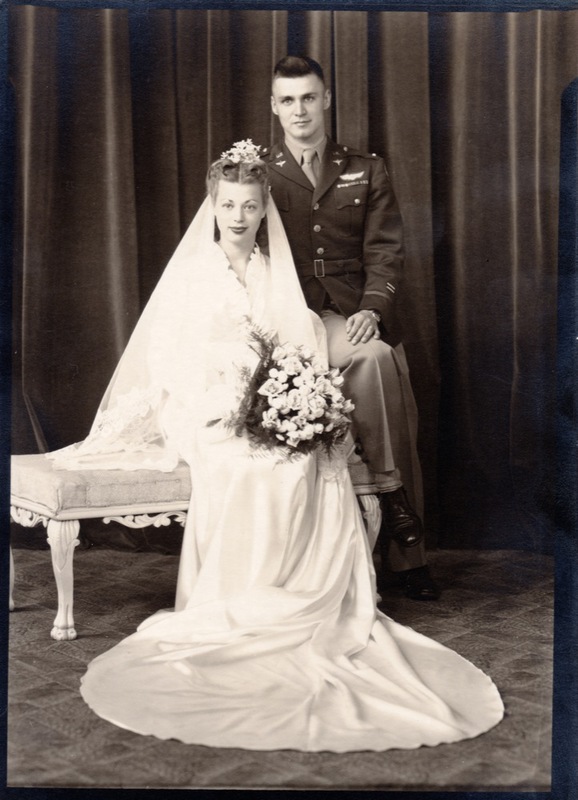 Wedding portrait, 21 Oct 1944. 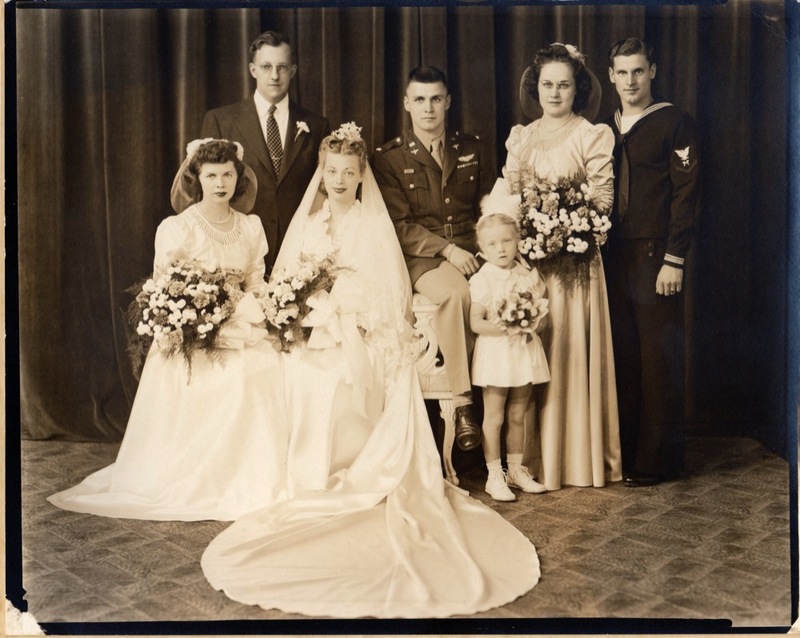 Kay Johnson is the flower girl. The man in the Coast Guard Uniform is Robert Krueger. On the far left is pharmacist George Cormack, Lloyd’s life-long friend. Next to him is Natalie Naftel, who went to nursing school with Norma and was her maid of honor. Next to Bobby is Elaine Poor, another friend of Norma’s. This is the “Seated” version of the portrait. There is also a “standing” version which I posted previously along with my Grandfather’s version of that day’s events. 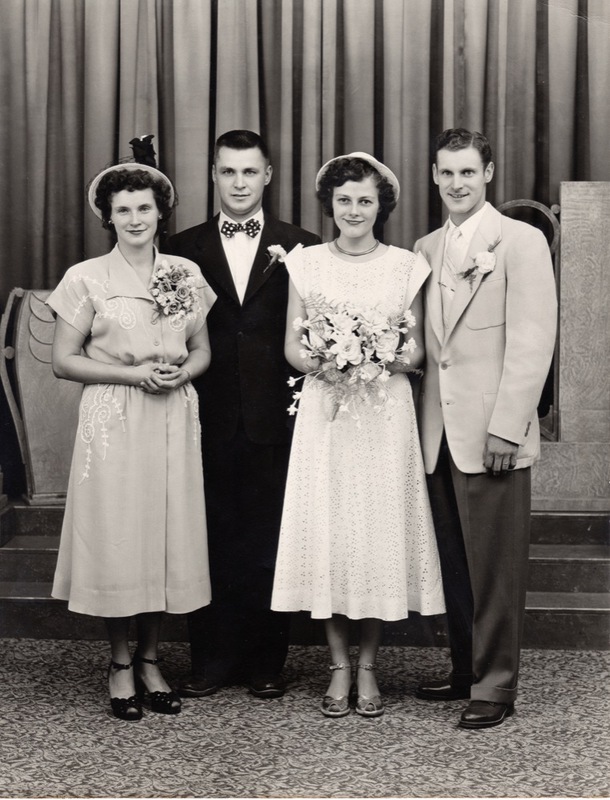 This photo is from the wedding of Robert Krueger and Shirley Paulus, 20 Aug 1949. Bette Krueger, Lloyd Krueger, Shirley Paulus, and Bobby Krueger (l to r). You can read a little about events that day here. 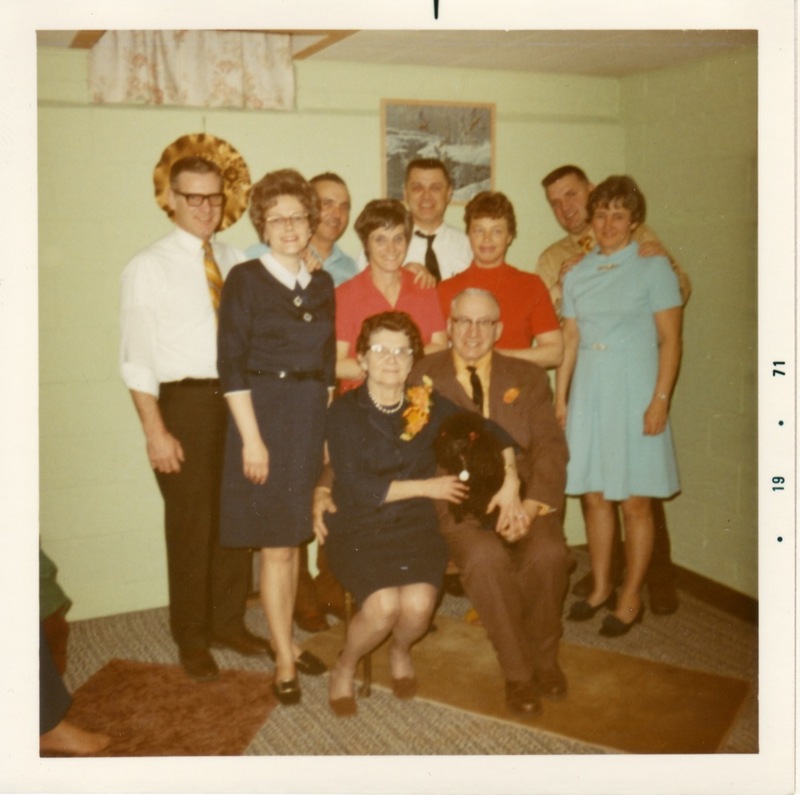 A get-together for the Krueger Family in 1971. 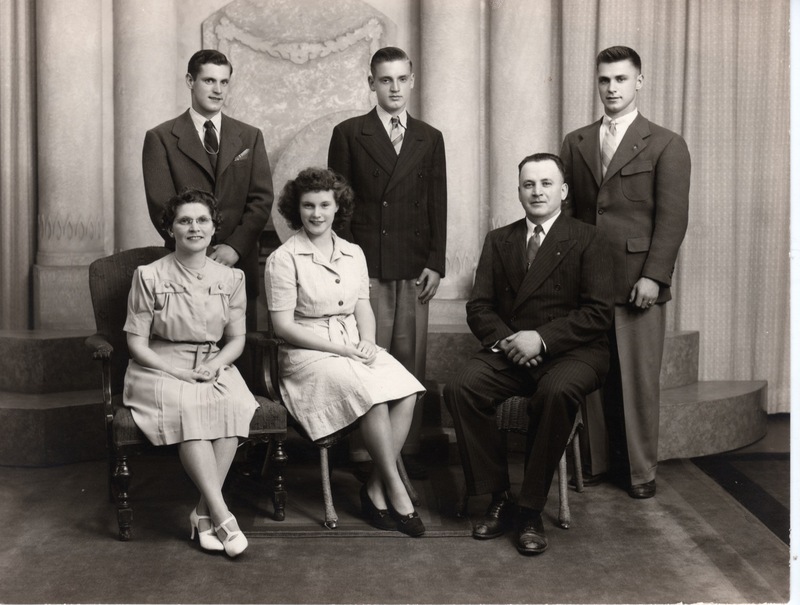 Robert Krueger, Shirley Paulus Krueger, Wally Radloff, Bette Krueger Radloff, Lloyd Krueger, Norma Schmidt Krueger, Harvey Krueger, Elaine Hunt Krueger (standing l to r), Edith Curtis Krueger, Oscar Krueger (seated l to r). I don’t remember the dog’s name, unfortunately. 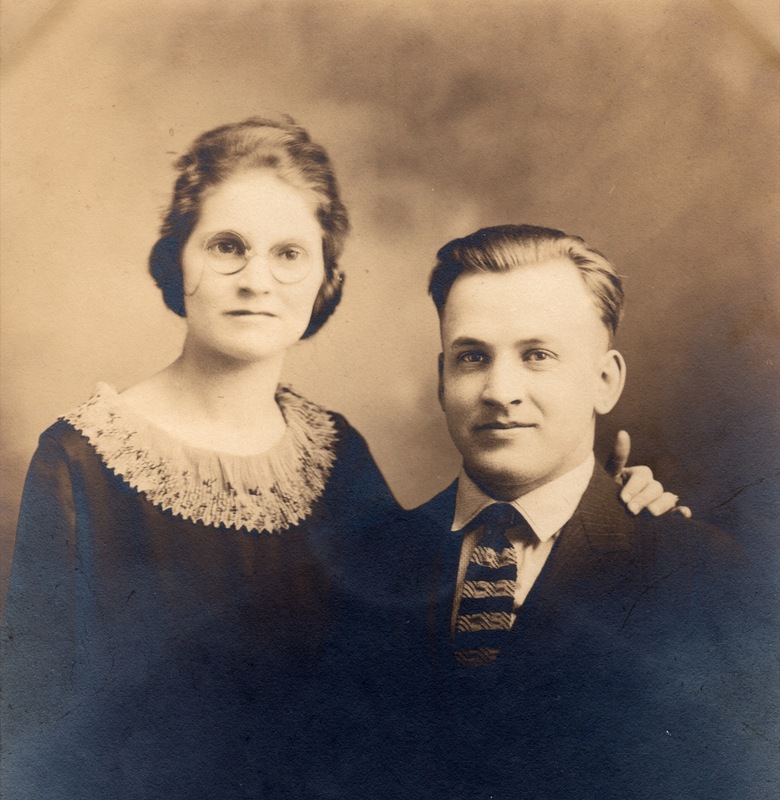 Robert Krueger, my great-grand-uncle, passed away last week. His daughter Esther has generously allowed me access to his archives, which are extensive. In total there must be over 3000 photos, clippings, documents, and other items. I will post the best of the best items here as I am able, but this will likely take a long time. This is the first bit of the collection. 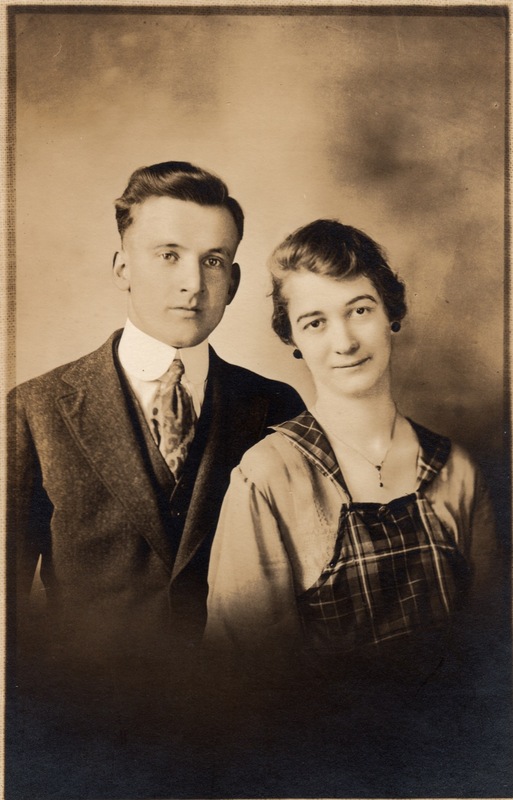 My great-grandfather Oscar Karl Robert Krueger (1893 – 1983) and his first wife, Anna “Annie” Terpstra. 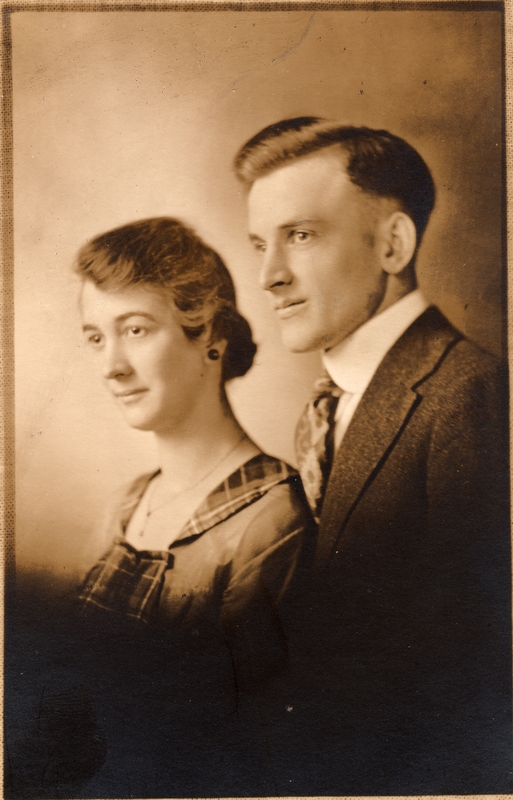 They were married just before Oscar was shipped off to fight in France in WWI, and were divorced upon his return from the war about a year later. Much had changed while he was gone. I’ll write that story another time. 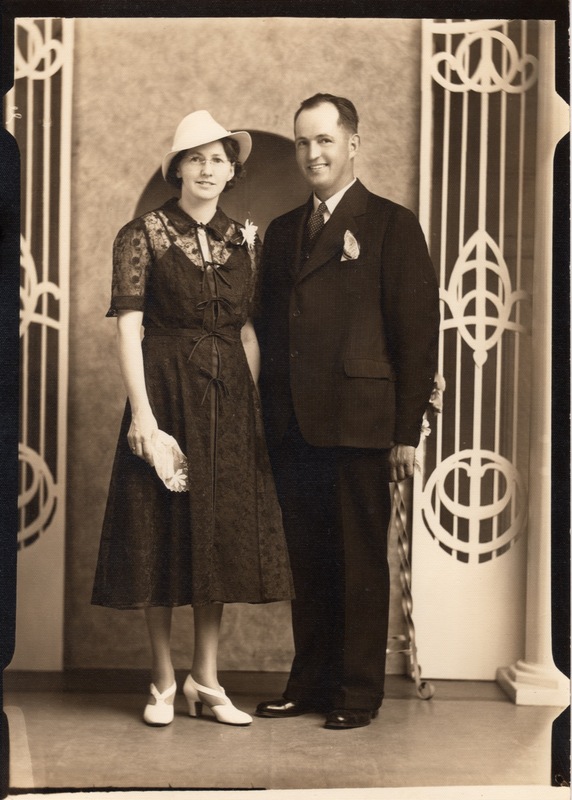 Oscar and his second wife, my great-grandmother Edith Edna Curtis (1903 – 1989) on their wedding day, 28 Feb 1921. 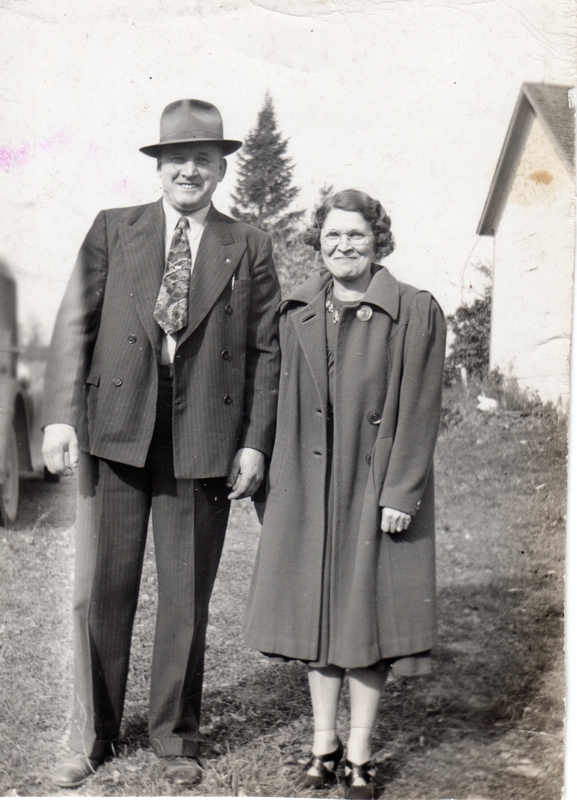 Edith was five months pregnant with my grandfather, Lloyd O. Krueger. 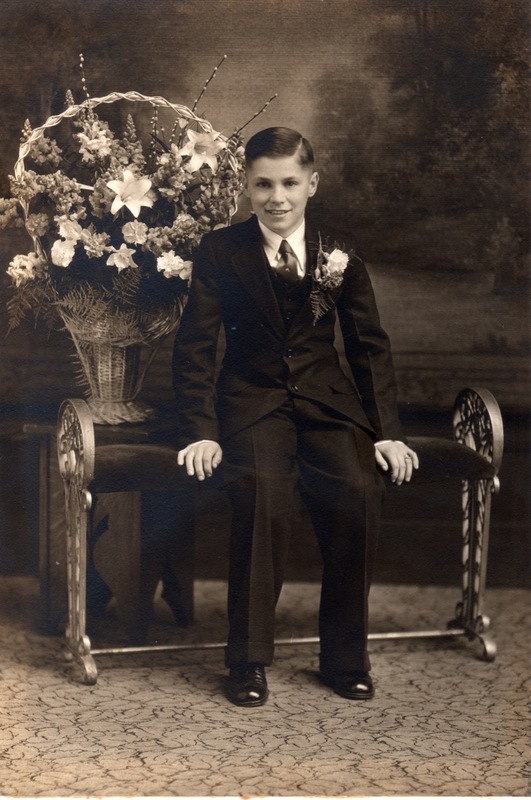 This is my grandfather, Lloyd Oscar Krueger (1921-2010) on his Confirmation Day, 1925. One of my all-time favorite photos from the Krueger Family. 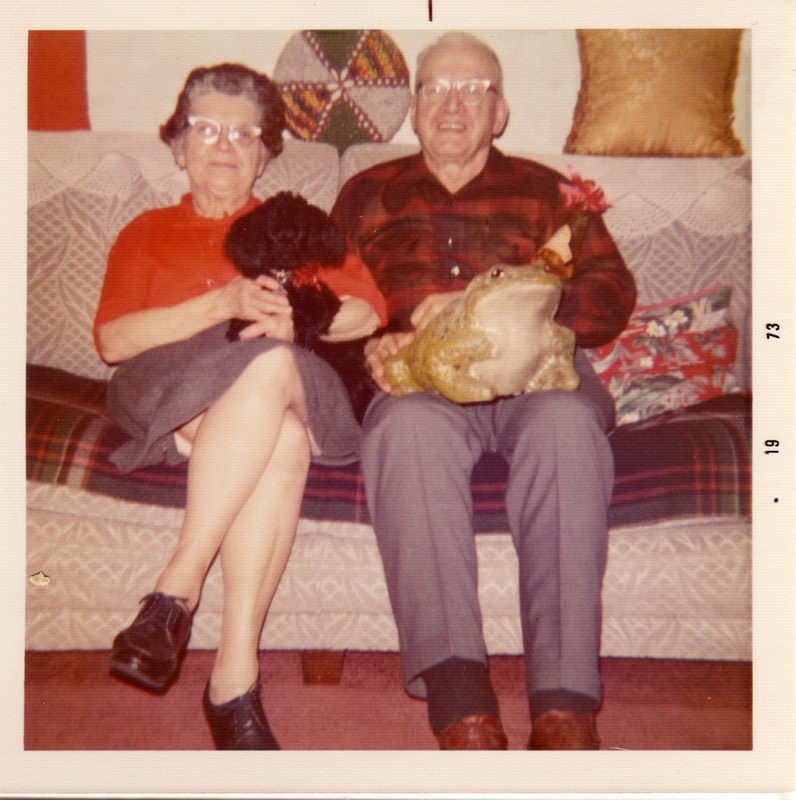 This one is labeled “Tom and Virginia Krueger”. Likely taken on their wedding day. Tom is the son of Oscar’s brother Eddie Krueger. A Krueger Family portrait taken about 1938. Back row: Bobby Krueger, Harvey Krueger, Lloyd Krueger. A casual shot of Oscar & Edith at home in 1973. 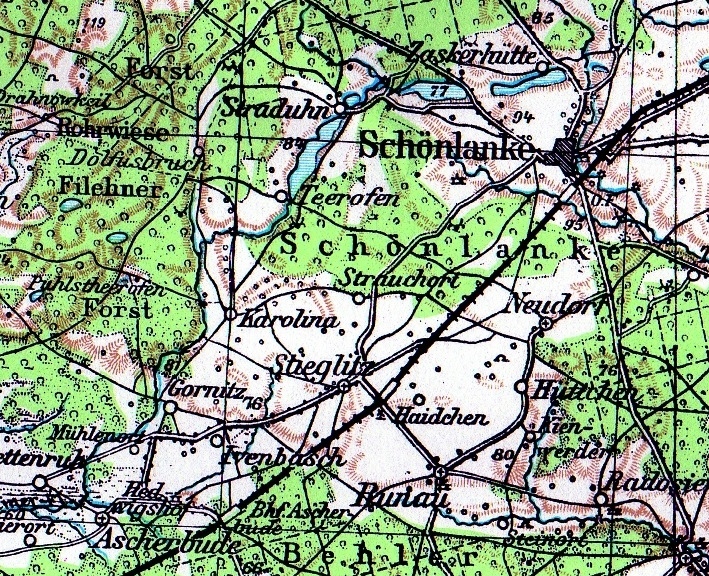 On this map of “Netzekreis County” you can see Schönlanke [Trzcianka, Poland today], where Carl Friedrich Schmidt married Wilhelmine Winkelmann. You can see Stieglitz [Siedlisko, Poland today], where Christian Winkelmann registered the death of his wife, Charlotte Börke. You can see Karolina [Rychlik, Poland today], where the Winkelmann family lived, and where Charlotte Börke Winkelmann died. You can see Runau [Runowo, Poland today], where Friedrich Schmidt registered the birth of his daughter Auguste Bertha Schmidt in 1880. You can see Gornitz [Górnica, Poland today], where the Schmidt family lived from 1880-1892, where Auguste Bertha Schmidt was born, and from whence they immigrated to the US. 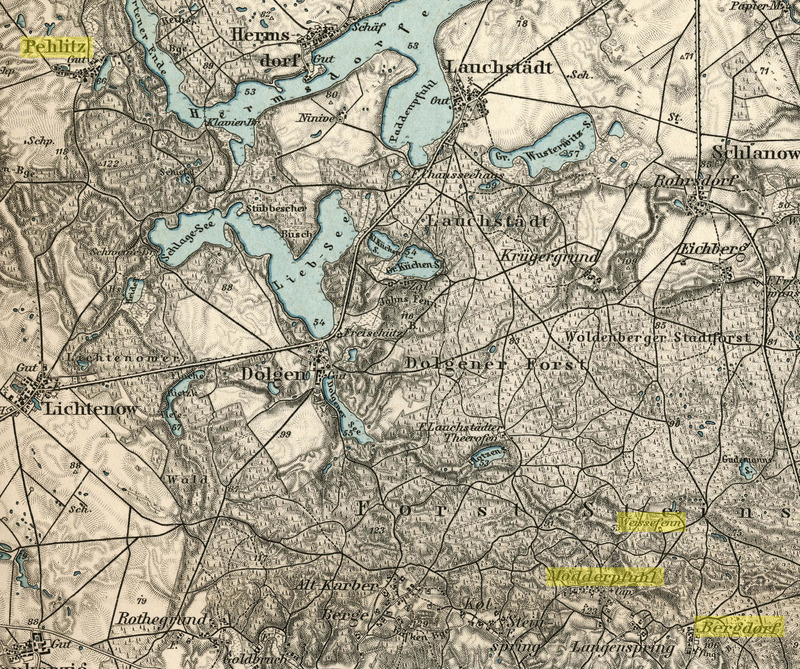 You can also see Ascherbude [Biernatowo, Poland today], the city from whence Emil Prielipp immigrated to the US using a ticket purchased by Wilhelm Schmidt. 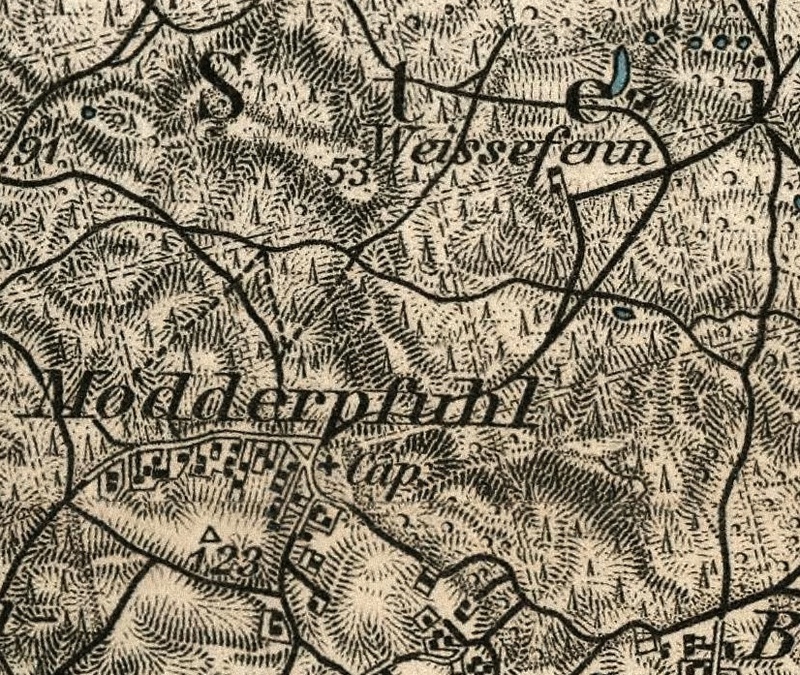 On this map of “Friedeberg County” you can see Pehlitz [Pielice, Poland], where Charlotte Börke Winkelmann was born, and the town of Modderpfuhl (which means “Mud Puddle” in the Northern German dialect) [Modropole, Poland today], where Johann Ludwig Schmidt was born. 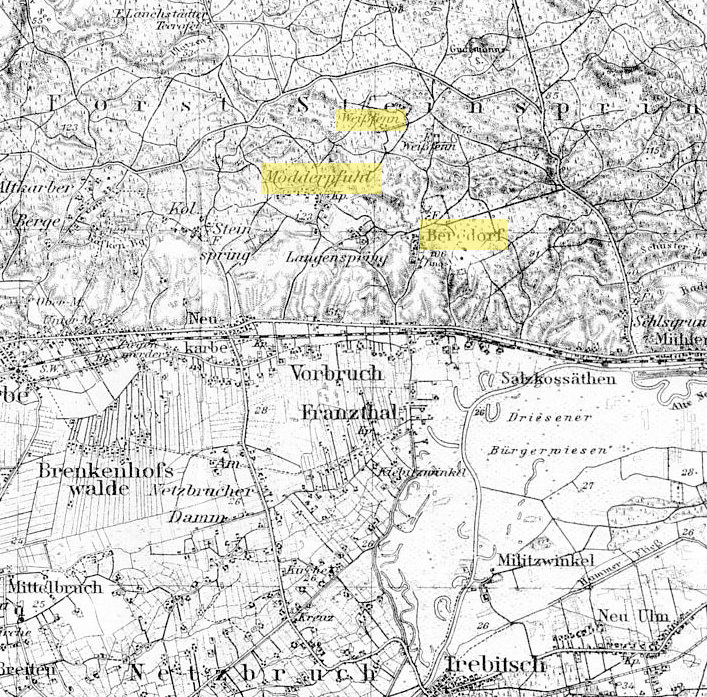 You can also see the town of Bergdorf [just below Modderpfuhl] where Wilhelmine Winkelmann’s brother Franz Winkelmann was born. Not shown, unfortunately, is the town of Weißfenn where Carl Ernst Wilhelm Schmidt was born. It is called Chojna, Poland today, and is about 1.2 miles northeast of Modderpfuhl. Interestingly, you can see a small road that leads from Pehlitz through the Steinspring Forest right to Modderpfuhl. I’m wondering if it was common to traverse the forest to get to the Netzbruch region you can see at the bottom of the map. That would possibly explain how the Schmidt and Winkelmann families met. 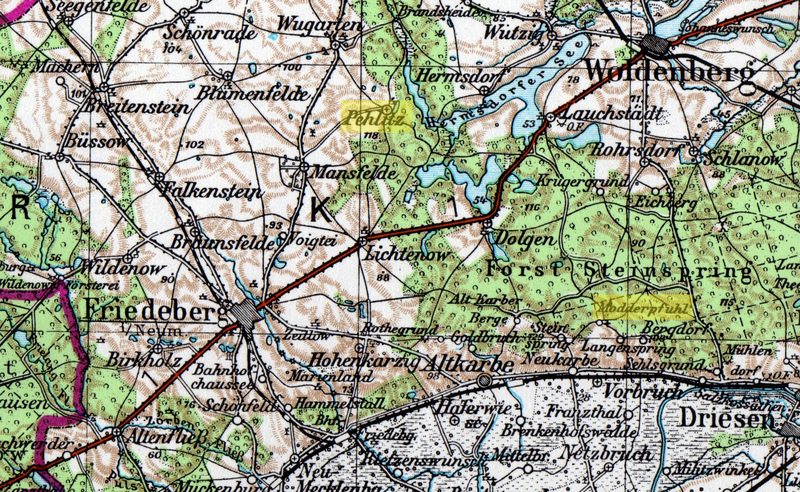 In any case, they both started out here in Kreis Friedeberg and ended up in Kreis Netzkries, in the map above. I have found a document in the registry office in Berlin. Christian Winkelmann shows the death of his wife! hundred and eighty and five (1885). Charlotte Börke Winkelmann death certificate. Charlotte was born in Pehlitz, Kreis Friedeberg, which is to the northwest of Modderpfuhl, Weissfenn, and Bergdorf, other towns where the Winkelmann and Schmidt families lived in Kreis Friedeberg. Pehlitz, Modderpfuhl, Bergdorf, & Weissfenn. Kreis Friedeberg. A few new photos of my great grandparents Lulu Maria Cairns and John Prescott “Jack” Forrest have come into my possession. I thought I’d share them here. Some of the new photos came from my father, Fred Thomas III. He got them when his parents passed away, and they seem to have come from the collection of Helen Duff “Duffy” Forrest. The others came from Tom Forrest, who is Jack Forrest’s grandson. 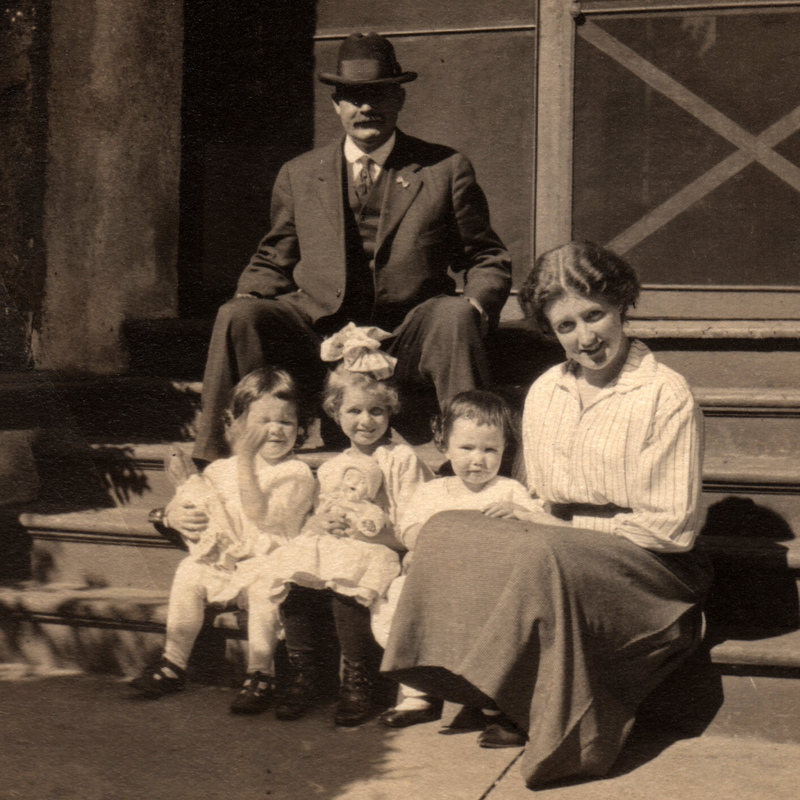 This photo shows Jack and Lulu Forrest in about 1917. The girl waving is Helen Duff Forrest. The blonde girl is unidentified (perhaps a cousin or neighbor). The other little girl is my grandmother Mildred Jean Forrest. Courtesy of Fred Thomas III. 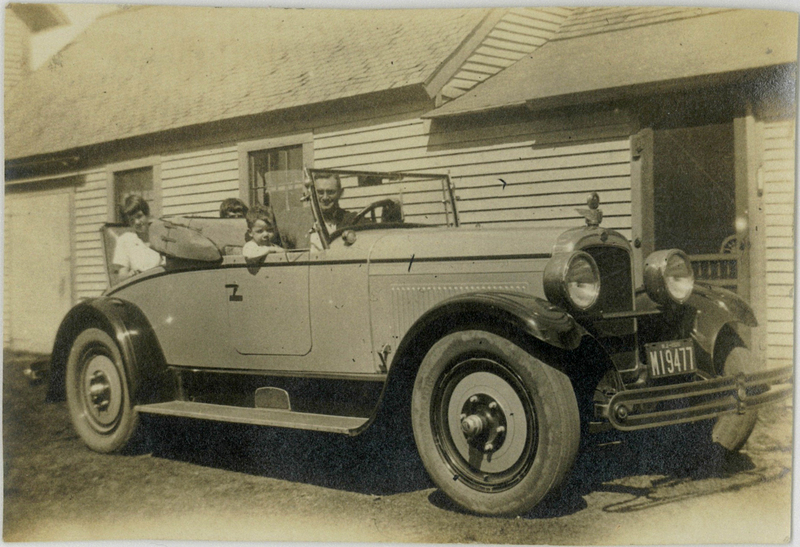 This photo from about 1926 shows Helen Forrest in the back seat and John Prescott Forrest Jr. in the front seat next to his dad. Can anyone identify this convertible? It looks like quite a beast! 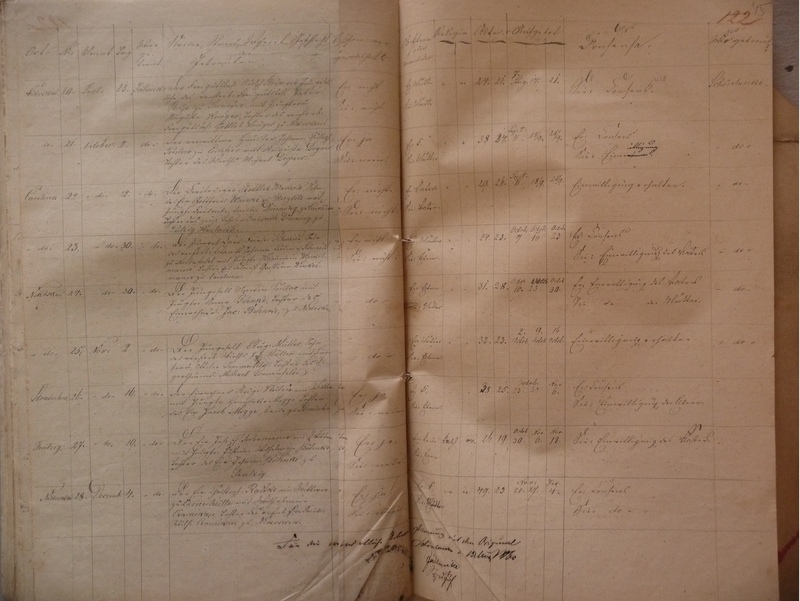 This is the marriage record for my 3x great grandparents. It says they were married in the town of Schönlanke, Posen, Prussia [which is called Trzcianka, Poland today] in 1859. This is only 8 miles from Gornitz, the town where the Schmidt family was living when they came to the US in 1892.
daughter of the Kolonist Christian Winkelmann from Carolina. Bans of Marriage:  October 9th, 16th, 23rd.